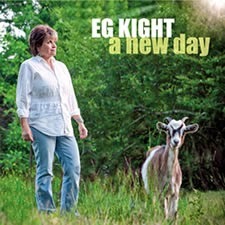 I just received the newest release (September 16, 2014), a new day, from EG Kight and she displays a full deck of down home sounds. Opening with soulful ballad Holdin' On, Kight, backed by drummer Gary Porter, bassist Johnny Fountain, guitarist Ken Wynn and keysmith Mike Harrell, sets a wholesome tempo for this new endeavor. Shuffle track, Graveyard Dead Blues, opens with Harrell on electric piano and Kight on solid vocals. Wynn whips out the slide for some hot, freewheeling guitar work and Harrell takes a nice piano solo as well. On blues ballad, Comin' Down With The Blues, Wynn plays a bluesy melodic guitar intro as well as a tasty solo and Kight holds the audience in the palm of her hand as she sings from her heart. Ex Cowboy Tommy Talton opens with a reverb saturated guitar riff, leading Kight into a full tent revival track backed really nicely by Willie Morris. Randall Bramblett adds his signature on B3 and Paul Hornsby contributes cool piano work. Very nice! On Catch The Wind Kight sings both lead and back vocal for an extremely pleasant blend. One of my favorite tracks on the release, this track is a solid soul ballad with Hornsby on B3 and Harrell on piano. Guitarist, Wynn takes another well articulated guitar solo icing this beautiful vocal duet. Bad Times is another exceptional soul track on the release featuring Greg Nagy sharing the lead vocal spot with Kight. Instrumentally, Cliff Meyers (tenor sax)really lays it out there with Bill Stewart (drums), Marshall Coats (bass), Tommy Talton (guitar), Paul Hornsby (piano and B3), Marcus Henderson (alto sax), Earl Ford (trombone) and Jerry Mullins (trumpet)really tow the load. Misunderstood is a clear radio track with a hi stepping beat, Kight again singing duet with herself and sweet guitar solo from Talton. Low Mileage Woman has a Latin beat reinforced by Johnny Fountain building a cool bass line and solidified by Gary Porter on drums. Harrell takes a nice ride on the piano as does Wynn on guitar. Another clever track that could easily see cross interest on the airwaves. Time To Move On is the bluesiest track on the release, stripped down and featuring Talton on acoustic guitar and slide. Paul Hornsby plays some particularly nice piano riffs supporting Kights superb efforts on this release closer.